, an historical artist, was born at Sassuolo, near Modena, in 1580, and was educated in the academy of the Caracci, where he learned design; but he frequently attended the schools of Baldi and Passerotti, to study after the naked. Yet to acquire a proper knowledge of colouring, he visited Venice, and carefully examined the productions of Titian; and at. his return to his own country, the best judges of the art of painting were much pleased with his works, as they seemed to possess an agreeable mixture of the style of the Caracci, and the tints of Titian. 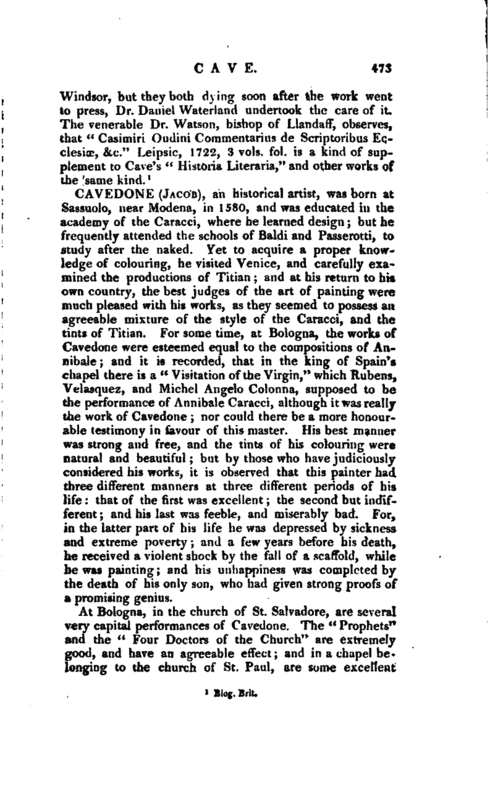 For some time, at Bologna, the works of Cavedone were esteemed equal to the compositions of Annibale; and it is recorded, that in the king of Spain’s chapel there is a “Visitation of the Virgin,” which Rubens, Velasquez, and Michel Angelo Colonna, supposed to be the performance of Annibale Caracci, although it was really the work of Cavedone; nor could there be a more honourable testimony in favour of this master. 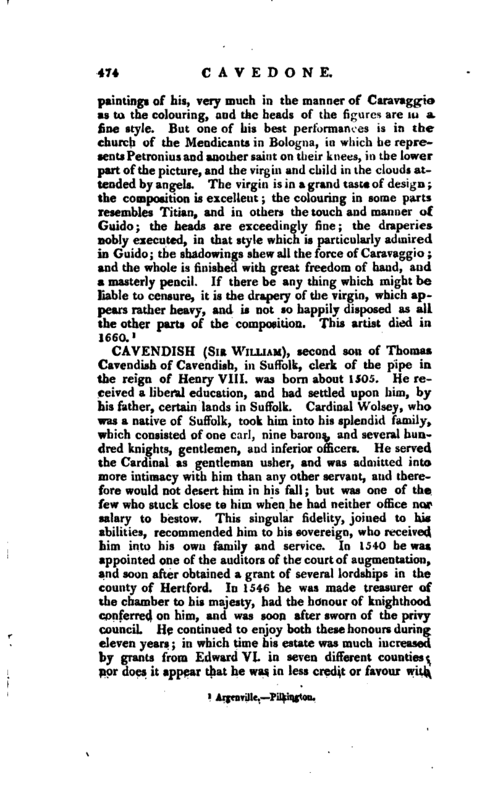 His best manner was strong and free, and the tints of his colouring were natural and beautiful; but by those who have judiciously considered his works, it is observed that this painter had three different manners at three different periods of his life that of the first was excellent the second but indifferent and his last was feeble, and miserably ba.d. for, in the latter part of his life he was depressed by sickness and extreme poverty; and a few years before his death, he received a violent shock by the fall of a scaffold, while he was painting; and his unhappiness was completed by the death of his only son, who had given strong proofs of a promising genius.